Hint: Here having total two diagonals and having four blocks. So formula for that 4 x 2 = 8 number of triangles. Hint: Here having total two diagonals and having eight blocks. So formula for that 8 x 2 = 16 number of triangles. Hint: Here each square having 8 no. of triangles and combine squares having 2 no. of triangles. So total number of triangles – 8 + 8 + 2 = 18. Hint: Here each square having 8 no. of triangles and combine squares having 4 no. of triangles. So total number of triangles – 8 + 8 + 8 + 4 = 28. Trick to count no of triangles : Intersection of diagonals in a square, rectangle, rhombus, parallelogram, quadrilateral and trapezium will give eight triangles. Hint : No of parts ” n” = 5 so according to formula 5 x 6 /2 = 15. Note : Consider only integer part from answer obtained in above formula ( For example the answer may come 13.12 then consider only “13”. Also remember You don’t have to round off the number for example answer may come 36.8 then consider only “36”. 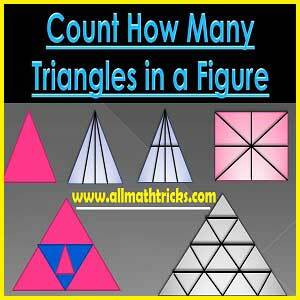 We hope this page “Trick to count no of triangles” fulfill your requirement. Please give feed back, comments to improve this and don’t forget to share this page. U people r just awesome… I was literally struggling to solve these problems in my police sub-inspector exams… But now I just spent 30 min …Ready to solve complex problems..Thanks a ton for ur genuine efforts…way to go keep up the same work going on. Thanks a lot for the tricks. They are used in all competitive exams. This is the best website to learn to count no. of triangles lesson. Because most of the websites I’ve seen are showing wrong and different answers for the same question. Finally, I am here happy to find valid and correct answers, and also methods to do it in the right way. Thanx a lot.